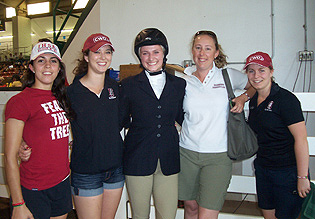 Stanford University's Claire Margolis (center) was one of only four freshmen competing in a field of 36 riders in the Cacchione Cup Competition at IHSA Nationals in Raleigh, North Carolina May 4th and 5th. Margolis had the top over fences score, an '88' as determined by Judges R. Scot Evans and Chrystine Tauber. Margolis is seen here with Cardinal coach Vanessa Bartsch (second on right) and several teammates on May 4th. Raleigh, NC - Have you ever heard the saying "If at first you don't succeed, try, try again!"? Eleven of the 36 riders who qualified to compete in the 2012 IHSA Nationals Cacchione Cup Competition had competed for the prize once before, with a handful having competed in two prior Cacchione Cup competitions. Amanda Gelderman of the University of Montana Western and Rori Fiebert of Washington University in St. Louis were competing in their third consecutive Cacchione Cup competitions. Of these two only Fiebert (a senior, from Boca Raton, Florida) had reached the top ten, having been sixth one year ago when Nationals took place for a second consecutive season at the Kentucky Horse Park in Lexington, Kentucky. Seven of the 2012 Cacchione entries had competed at Lexington in 2011 and were making their second appearance. Tamara Morse, a Washington & Lee University senior from Bristow, Virginia had placed the highest. Morse was fourth without even making it to the work-off phase. University of California at Los Angeles junior Camille Pease was eighth. From Palo Alto, California Pease was the third of four members of the 2011 top ten to repeat as the rider with the most combined open flat and fences points within her respective region. Brittany Johnson was the fourth member of this quartet. A senior from Farmington, Connecticut Johnson was tenth at the Kentucky Horse Park. Ciara Menkens of Delaware Valley College (junior, from Brick Township, New Jersey), Whitney Mahloch of St. Mary of the Woods College (senior, Plymouth, Wisconsin) and Kathleen Walsh of the combined University of Notre Dame/St. Mary's College of Indiana IHSA team (sophomore, Easton, Connecticut) had received sub-par over fences scores which kept them out of the top 24 and thus eliminated their chance to compete in the flat phase. Abigail Zanone of Oregon State (sophomore, Portland, Oregon) and Gelderman (senior, Paulsbo, Washington) qualified for the flat phase but their combined Judge's scores at 2011 Nationals did not place them inside the top ten. Two other riders who did not qualify for the 2011 Cacchione Cup Competition but who were part of the 2010 Cacchione class at Nationals qualified in 2012. Edward "Ben" Miller of Western Michigan University (senior, from Rockville, Maryland) had finished outside the top ten during his first Cacchione Cup appearance. The same could not be said for a rider whose first name was spelled "Kelse" at the time. Kels Bonham of Savannah College of Art & Design (senior, Eolia, Missouri) survived both phases to reach the work-off in 2010. During the work-off Bonham was one of four riders who remained for further testing (these riders swapped horses and continued) and eventually she was the reserve champion. Bonham was bested for the top spot in Zone 5, Region 3 by then University of Central Florida senior Katie Taylor during the 2010-11 season (in plain english this means Taylor earned more combined open flat and fences points during the regular season shows than Bonham. Only the rider with the most combined flat and fences points in each of the IHSA's 36 regions gets to compete at Nationals for the Cacchione Cup). In 2011-12 Bonham was ahead at one point during the fall, then fell as far as 13 points behind but rallied to tie Sarah Gottschaulk of Georgia Southern and Eliza Hay of the College of Charleston for the top spot on March 3rd as Charleston hosted the regular season finale. When there is a tie such as this one a special class is added to the Regional show to break the tie and send one rider on to Nationals to compete for the cup. Georgia Southern hosted Regionals the very next day and Bonham won the three-way ride-off to represent Zone 5, Region 3 in the Cacchione class for the second time in three seasons. 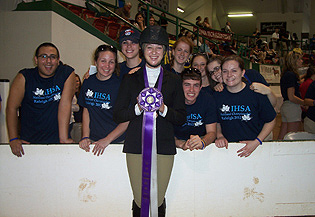 Though Cazenovia College had only three riders entered at 2012 IHSA Nationals the Wildcats brought a few horses and lots of students. Cazenovia junior Brandi Carpenter is amongst many of her teammates after placing seventh in the Cacchione competition. 25 other riders were making their first and perhaps only Cacchione Cup appearance. Four of them were new to college this season. Rebekah Scharfe of Lafayette College and Catherine Billings of Converse College had to survive close open rider races in their respective regions (three points or less) while Lauren Powers of Penn State University and Claire Margolis of Stanford University won their regions by double digit margins (Margolis finished 30 points ahead of her nearest rival). While these riders were the only freshmen entered four sophomores were making their Cacchione debut. Kaley Silipo of the University of Colorado at Boulder, Emily Walker of the University of Minnesota - Twin Cities, Allan Palmer of the University of the South and Lyndsey Burns of Roger Williams University had all captured the top spot in their respective regions, with all but Burns accomplishing 20 points-plus margins to do it (As of 6/1/12 Burns final margin is unknown as we are still waiting and hoping for the Zone 1, Region 1 year-end points in several categories - Editor). Seven juniors were first-time Cacchione entries. Only two of these riders - Karli Postel of Goucher College and Cori Reich of Centenary College - captured their regions by fewer than ten points. Postel finished seven points ahead of teammate Amory Brandt while Reich finished nine points ahead of teammate Kelsey Bernini in what was a most remarkable Zone 3, Region 3 race. The remarkable part was that Centenary claimed eight of the top nine riders in their region. Other juniors in the Cacchione Class were Alexandra Kemp-Thompson of Seton Hill University, Jamie Donovan of Miami University of Ohio, Katie Hansen of St. Andrews University, Brandi Carpenter of Cazenovia College and Casey Lorusso of Stonehill College, the only junior to finish over 20 points ahead of her nearest rival. And ten seniors were making what will likely be their only Cacchione Cup appearance. Katie LaDow of the University of Delaware and Lauren Patterson of the University of Kentucky captured high point open rider honors by exactly ten points in their respective regions. Both Kelly Campbell of Skidmore College and Lauren Horth of Endicott College could say the same thing except their margin of victory was nine points. Margaret Swanson of Mount Holyoke College edged out teammate Lexie Lohrer by five points to represent Zone 1, Region 3 while Lauren Fay of Virginia Intermont College edged out teammate Audrey Hanlon by three points to represent Zone 5, Region 4. Three different races were settled by one point: Amy Mitchem of West Texas A & M University won a squeaker over Gabrielle LeBoeuf of Louisiana State University in Zone 7, Region 2; Bronwyn Scrivens of Cornell University outlasted Kali Knickerbocker of Nazareth College in Zone 2, Region 1 while Kristen Zimmerman of C.W. Post College (part of the Long Island University system) finished one point ahead of Olivia Cary of Stony Brook University in Zone 2, Region 4. K.T. Steward of the University of Findlay was a landslide winner compared to these other first-time Cacchione seniors, finishing 13 points ahead in Zone 6, Region 1. The Cacchione Cup over fences phase was the third class on day two of 2012 IHSA Nationals. The James B. Hunt Horse Complex in Raleigh, North Carolina played host to IHSA Nationals for the first time, and on day one 12 of the 36 Cacchione entries competed at least once in either individual open flat or individual open over fences (Morse was second in individual open flat for the best ribbon any of the 12 earned on opening day). The first of 36 to go was Miller, who turned in a respectable '75' score. Donovan (junior, Armonk, New York) was second in the order of go and her combined score of '87' from Judges R. Scot Evans and Chrystine Tauber not only gave the Miami of Ohio junior the top score for the moment it was also superior to any over fences score from the 2011 Cacchione Cup competition (Shelby Wakeman, then a first semester senior at New York University and the eventual Cacchione Reserve Champion, received a score of '86' to lead the field through one phase a year ago). Burns (sophomore, Newtown, Connecticut) was third in the order of go and received a score of '67.' It was far too early to tell if this would be a high enough score to propel Burns into the flat phase. At 2011 Nationals the 24th and final rider to get in was Miranda Cain of West Virginia University with an over fences score of '69' so Burns was clearly on the bubble. Powers (freshman, Yardley, Pennsylvania) was clearly headed to the flat phase after going fourth, as Evans and Tauber combined to give the Nittany Lion freshman a score of '82.' Mitchem (senior, Brush Prarie, Washington) went fifth and received a healthy '78' score. Carpenter (junior, Orlando, Florida) was almost as good, going sixth and receiving a '76.' Zimmerman (senior, Massapequa Park, New York) rode seventh in the order and received a '69.' In 2011 this was good enough to get into the flat phase but would it be good enough today? Swanson (senior, Woodbridge, Connecticut) went eighth and endured the low score up to the moment with a '65.' Morse went ninth to complete one quarter of the class. The keeper of the 2011 white ribbon received a score of '77' to almost certainly earn a place in the flat phase. Horth (senior, Dalton, Massachusetts) was next and earned a '66' while Hansen (junior, Toledo, Ohio) went eleventh and had a refusal to drop what otherwise might have been a good trip into a '40' score. Postel (junior, Newbury Park, California) took everyone past the one-third mark of the division with a score of '68' to also rest firmly on the bubble. Steward (senior, Boca Raton, Florida) was next and received a score of '72.' The next four rides gave riders with scores in the upper '60's hope of making the cutoff for the flat phase. Walker went 14th (a '60'), Patterson 15th (a '59'), Johnson 16th (a '63') and Fiebert 17th (a '38'). Each rider stayed on course but made a variety of errors to drag their scores down. University of the South sophomore Allan Palmer (on left) had several supporters as he competed for the Cacchione Cup. Many were wearing 'Team Palmer' shirts (such as Tigers senior Heather Walsh, on right). 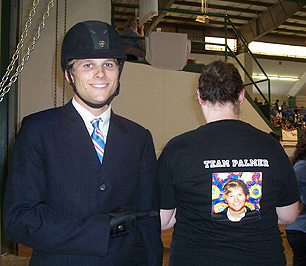 Others may want to make shirts for their open riders as Palmer went on to place fifth in the Caccchione class. The 18th rider to go was Pease. The UCLA junior, who rode twice in the over fences phase a year earlier (a '61' score was nullified after receiving a re-ride and a score of '74.5') ended the string of low scores. The division was halfway completed after Pease received an '84' to move into second place for the time being. Gelderman's score of '71' had her on the bubble but probable. Bonham was assured of going into the flat phase. The 20th rider in the order of go received an '83' to slot in behind Donovan and Pease for the time being. Menkens went 21st and received a '70.' At this point there were ten riders with scores in the '60's or lower. If 12 riders finished below Menkens then she would be in as would anyone else in the '70's or higher. Zanone went 22nd and received a '68.5. 14 rides remained and anyone who could score above a '70' would be flat phase-bound! Silipo (sophomore, Vail, Colorado) went 23rd and put Menkens on the bubble with a '70.5.' Scharfe (freshman, Manchester, Massachusetts) fell off in a corner after roughly five jumps but would receive a re-ride. Perhaps helped by a series of underwhelming performances ahead of him, Palmer (sophomore, Memphis, Tennessee) went 25th and lit up everyone's eyes when he took over second place with a score of '85.' The high scores continued as Campbell (senior, Cohoes, New York) went 26th and received an '82.5.' Scrivens, the first Cornell rider in program history to compete for a Cacchione Cup was also the first of two Canadians in the division. Taking the division across the three-quarters mark, Scrivens (senior, Spruce Grove, Alberta) received an '81.' Lorusso (junior, Wrentham, Massachusetts) went 28th and appeared to receive a score of '61.' However Lorusso would be given a re-ride at the end of the division along with Scharfe. Margolis (freshman, Carmel Valley, California) went 29th and knocked everyone down a place with a score of '88' to take over the lead. Billings (freshman, Tallahasse, Florida), who may be the first Converse College rider ever to compete for the cup, went 30th and received a score of '81.25.' Fay (senior, Shelburne, Vermont) went 31st. Her score of '83.5' put her in fifth place behind Margolis, Donovan, Palmer and Pease. Not since Zanone went 22nd had a rider scored below a '70' (excluding the upcoming re-rides). Mahloch received a score of '64' to put anyone with a score of '70' or higher into the ride-off. Walsh went 33rd and received a score of '74' to clinch a flat ride a short time later. Many probably didn't know that LaDow incurred a riding-related injury prior to Zones which kept her from showing in individual open over fences on April 7th. There was some concern that LaDow would not be able to ride at Nationals. However doctors determined she could ride but would need surgery over the summer. When she showed at Nationals LaDow was wearing a plastic device shaped not unlike her lower leg inside her right boot. Because of this device LaDow could not put weight into her right stirup. Going 34th the senior from Unionville, Pennsylvania incredibly survived, receiving a score of '70.25.' Reich (junior, Ivyland, Pennsylvania) paid $12.00 for a professional boot shine from Benny Cash, who has traveled to many of the big shows throughout the south (Cash has his own stand at the Hunt Horse Complex, and appeared to be doing brisk business over the first three days). Reich shone in the ring, going 35th and receiving a score of '79.' The second Canadian in the ring was also the 36th and final scheduled rider. Kemp-Thompson (junior, Ottawa, Ontario) received a score of '73.' Lorusso was the first re-ride and she received a score of '69.5.' This meant that Lorusso was in but that Zimmerman would need a sub-69 score from Scharfe in the final re-ride to continue her season a few hours. Scharfe made it over all the fences and received a score of '70.75' to conclude the jumping phase. Though this article spelled out who the top 24 were, many had not kept a running tab of who ranked where. As a result several riders simply waited for the print-out to be posted to learn who the top 24 were. This printout was posted near the running team totals while team open reining was in the ring. Everyone from Margolis with an '88' through Lorusso with a '69.5' was coming back. The truth be told only a few riders who had survived really had a chance to actually Win the Cacchione Cup, this unless everyone who was at the low end over fences scored well in the flat and everyone who was great over fences suddenly forgot how to ride. She won six of eight open flat classes during the regular season and had the second best flat phase score (an '86'). She is Skidmore College senior Kelly Campbell (on horse) and she is seen here with Head Coach Cindy Ford (on right) and Assistant Coach Belinda Colgan (on left) after placing second in the 2012 Cacchione Cup Competition. Riders had to go through a second horse draw for the flat phase. There were actually two draws as the division was split into two sections of 12. Riders in each of the two flat classes walked, trotted and cantered in each direction. Work without stirups was also performed. Eventually Tauber and Evans lined up each section and announcer Kenn Marash alerted each group of 12 to pat their horses and that they were excused. Then came the waiting game. Since the current format of allowing riders to jump first and then flat went into place for 2003 Nationals as many as 14 were called back in 2010 (and that was the final season that all riders flatted; There were only 31 regions and thus 31 Cacchione riders at that time) and as few as three were called back last season. It was not until roughly 7:00PM (after all the day two hunter seat classes had been completed and the final western class of the day was entering the ring) that the callback for the work-off phase was posted. For the second year in a row only the top three riders were invited back to test the next morning. The flat totals, now available on the posted print-out, revealed that Bonham (who rode in section B) had the top flat score with an '87' followed by Campbell ('86' in section A), both Morse and Carpenter ('84.5' scores for Morse in A and Carpenter in B), Walsh ('82' in B) and Margolis ('81' in A). Bonham's average was the highest at an even '85' while Margolis was currently second with an '84.5.' Campbell, with an '84.25' was considerably ahead of Morse with an average of '80.75.' The next four riders were close to Morse (Palmer at '80.625'; Donovan '80.5'; Carpenter '80.25' and Powers at an even '80'). Fay was over a point behind an eighty average, sitting at '78.75.' At 2011 Nationals there had been a similar gap between third and fourth and on that occasion the riders from fourth place to 14th were all close enough to each other that the judges would have had to go to 14 for the work-off phase had they not stopped at three. Because Campbell and Morse were over three points apart the same rationale would apply. Strangely this meant that seven riders knew where they would place within the top ten when awards were presented the next day. Only seniors Bonham and Campbell along with freshman Margolis would have to ride again to sort out first through third. As has become customary at IHSA Nationals since the four-day format went into place in spring of 2004 the Work-Off Phase of the Cacchione Cup was the second class of the day during the Saturday session, also known as day three of Nationals. Both Bonham and Margolis competed in the first class of the day, team open over fences. Each had performed extremely well, with Margolis receiving a score of '82' for fourth place while Bonham won the class outright with a score of '85.' Bonham, Margolis and Campbell were asked to jump a short course (not all eight fences were part of it). In yet another case of the 2011 and 2012 Cacchione classes becoming eerily similar there was no further testing (2011 Nationals Work-off riders went over a full course but no further testing was requested at that time either). Marash announced that Cacchione riders should return to the in-gate as the presentation of awards would take place shortly. Because the work-off took place on a different day than either of the other phases the vast majority of riders who placed below tenth were no longer present on the grounds of the Hunt Horse Complex by Saturday morning. The Cacchione division and the individual AQHA Trophy (the western equivelent of the Cacchione Cup) are the only ones where all of the 'honorable mentions' are not announced over the loudspeakers by Marash. Therefore the announcements began with tenth place, which went to Pease. The UCLA junior's combined score of '157' or an average of '78.5' was an improvment over her '145' and '72.5' in 2011 even if her ribbon was a step down from eighth place. Fay was ninth with a combined score of '157.5' or an average of '78.75.' Since 2004 Virginia Intermont riders have made the top ten in the Cacchione Cup eight out of nine times, with Fay equaling former teammate Ashley Miller's ninth place ribbon one year ago. Powers was eighth with a combined '160' or '80' average. With Powers entered Penn State could claim each of the five most recent Zone 3, Region 1 Cacchione entries with four different individuals (Samantha Pandolfi, Elizabeth Lubrano, Kristen Cassone and Powers) having qualified in that time. While Penn State and Virginia Intermont have claimed the Cacchione entry from their region for some time Carpenter was the first non-St. Lawrence University Cacchione rider to represent Zone 2, Region 2 since the Wildcats' Megan Cowan competed for the cup in 2005. Carpenter was seventh with a combined '160.5' or '80.25' average. While many of the top ten entries had to re-dress in their show clothes for the awards presentation, the Red Hawks' Donovan was already dressed. The Miami of Ohio senior was seventh in team open over fences prior to the work-off. Donovan's combined '161' or '80.5' score resulted in sixth place. Palmer was fifth with a '161.25' or an average of '80.625.' Prior to the 2002-03 season Zone 5, Region 1 was not made up of the same schools as it has been (for the most part) since then. Over the ten year span that this region has contained the entire state of Tennessee (plus schools from several other Southern states) Palmer is only the second rider from this region to make the Cacchione top ten and the first this century from the University of the South. Morse can claim to be the most consistant rider over the past two Cacchione competitions, receiving the fourth place ribbon for a second year in a row. Morse's judges' scores from one season to the next barely changed, going from a combined '161' in 2011 to a '161.5' and '80.75' average. 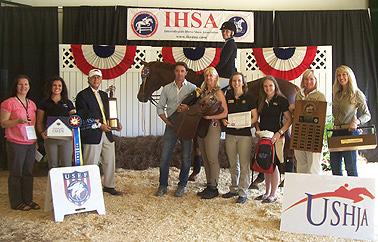 IHSA Founder and Executive Director Bob Cacchione (third on left) holds the Cacchione Cup while many sponsors and a few coaches join the photo after Kels Bonham of Savannah College of Art & Design (on horse) captured the 2012 Cacchione Cup. Though every rider who placed inside the top ten within a Nationals class had to fill out at least one thank-you card for a sponsor Bonham won the most prestigious of all the hunter seat awards and thus had to fill out cards for over a dozen different sponsors! While the results from tenth through fourth were essentially available to anyone who could read the printout posted near the scoreboard the top three would not remain status quo. Marash announced Margolis in third place, the Stanford freshman having earned a combined '169' or '84.5' average. This average was higher than Campbell's and for a moment it remained to be seen if Campbell's work-off round had moved her all the way from third to first. As it turned out Campbell had moved up to second. The Skidmore senior, who has trained with the Skidmore coaching staff since she was a sophomore in high school thanks to the close proximity of the Van Lennep Riding Center to her front door, had a combined '168.5' and '84.25' average before impressing Evans and Tauber enough to become the 2012 Reserve Champion. The top spot went unchanged. Bonham, whose combined total at 2010 Nationals was a '172' (an '82' over fences and a '90' on the flat) won the Cacchione Cup with a combined score of '170' or an '85' average. The senior from Eolia, Missouri grew up riding with her parents but of late calls SCAD coach Ashley Kelly her trainer. Bonham is the first rider from Zone 5, Region 3 ever to win the Cacchione Cup and only the second Zone 5 rider in IHSA history (Tara Brothers of the University of South Carolina in 2004 being the first) to take home the cup named in honor of Mario "Marty" Cacchione, the father of IHSA Founder and Executive Director Bob Cacchione. More Kels: Bonham, who won the individual championship at the ANRC finals a few weeks earlier, changed her first name from "Kelse" to "Kels" so that as many people as possible will pronounce it correctly. The presence of the 'e' at the end of her first name continued to lead many to call her 'Kelsey' even though that name is normally spelled with a 'y' or 'ie' at the end. Though the correct pronounciation had always been 'Kel-ss' the name change has apparently helped cut down on mistakes made by nearly everyone who has yet to meet the Equine Studies major who plans to become a professional horse trainer. Even more Kels: Bonham explained to us that many students who enroll at SCAD are pursuing performing arts degrees. "'Equine Studies' is a peforming arts major at SCAD,' said Bonham, who finished the final day of hunter seat competition at 2012 Nationals with a sixth in team open flat to go with two wins on the big stage. Bigger and Better: Zone 5 will undergo a mild reconfiguration for the fall of 2012. The IHSA will grow from 36 to 37 regions, with Zone 5, Region 3 being split into two regions (with one of the two gaining a few schools from Zone 5, Region 2). SCAD will be the only school from the state of Georgia going in with all the Florida schools in what will be known as Zone 5, Region 5. The remaining Georgia schools already in Zone 5, Region 3 along with the College of Charleston will add a few Georgia-based schools from Region 2. The current Zone 5, Region 3 had grown by leaps and bounds over the past three seasons, mostly due to new teams joining every season primarily from the state of Florida. There are apparently enough facilities to host in the planned reconfiguration that the split was approved by the IHSA Executive Board at their January meeting. Zone 5 will be the fifth IHSA Zone out of eight to be made up of five regions. Results from the 2012 IHSA Nationals Cacchione Cup Competition, held May 4th and 5th at the James B. Hunt Horse Complex in Raleigh, North Carolina. The Over Fences phase and the Flat phase took place on Friday, May 4th while the Work-Off phase took place on Saturday, May 5th. 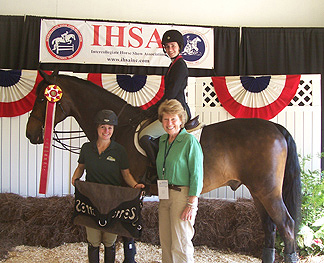 The Judges for all hunter seat classes at 2012 IHSA Nationals were Chrystine Tauber and R. Scot Evans.